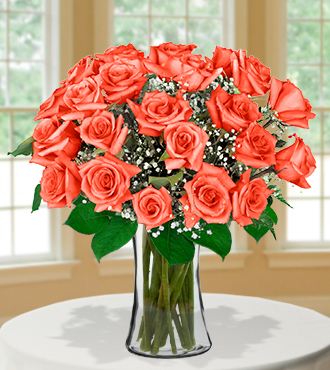 Take your gift giving above and beyond with a full bodied bouquet of long stemmed orange roses. Our orange roses are bright and exciting surrounded by baby's breath and greenery. The fullness of the arrangement is a feast for the eyes and is a perfect gift at any time of the year. Whether you want to say hello or congratulations, this bouquet is a contemporary take on a timeless tradition of rose arrangements. Choose a matching colored vase and send one today.